My favorite example is currently the Thurnh of St. Magdelener." (St. Magdalener is a particularly revered appellation for Schiava.) Meanwhile, while wearing white after Labor Day may be tradition- ally considered verboten, drinking white wine after the holiday is not only acceptable — it's downright advisable. That's especially true if you're talking about the kind of delicious and complex whites that are a perfect foil for spicy and hearty foods. Dishes like red lentils with cauliflower and chicken sausage, another recipe shared on Whole Foods' website for fall, with which Webster suggests a crisp glass of Charles Smith Kung Fu Girl Reisling. "It's full of flavors like white peach, Mandarin orange, and apricot, delivered with a core of mineralogy that makes the wine shimmer with energy and freshness," he says. Zantopp has his own theory of whites for the season. "My inclination is to recommend white Rioja from Spain made by R. López di Heredia, perhaps the most important producer of this category," he muses. 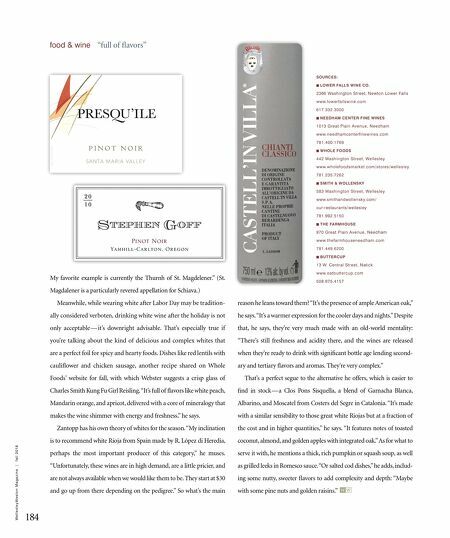 "Unfortunately, these wines are in high demand, are a little pricier, and are not always available when we would like them to be. They start at $30 and go up from there depending on the pedigree." So what's the main reason he leans toward them? "It's the presence of ample American oak," he says. "It's a warmer expression for the cooler days and nights." Despite that, he says, they're very much made with an old-world mentality: "There's still freshness and acidity there, and the wines are released when they're ready to drink with significant bottle age lending second- ary and tertiary flavors and aromas. They're very complex." That's a perfect segue to the alternative he offers, which is easier to find in stock — a Clos Pons Sisquella, a blend of Garnacha Blanca, Albarino, and Moscatel from Costers del Segre in Catalonia. "It's made with a similar sensibility to those great white Riojas but at a fraction of the cost and in higher quantities," he says. "It features notes of toasted coconut, almond, and golden apples with integrated oak." As for what to serve it with, he mentions a thick, rich pumpkin or squash soup, as well as grilled leeks in Romesco sauce. "Or salted cod dishes," he adds, includ- ing some nutty, sweeter flavors to add complexity and depth: "Maybe with some pine nuts and golden raisins." SOURCES: n LOWER FALLS WINE CO. 2366 Washington Street, Newton Lower Falls www.lowerfallswine.com 617.332.3000 n NEEDHAM CENTER FINE WINES 1013 Great Plain Avenue, Needham www.needhamcenterfinewines.com 781.400.1769 n WHOLE FOODS 442 Washington Street, Wellesley www.wholefoodsmarket.com/stores/wellesley 781.235.7262 n SMITH & WOLLENSKY 583 Washington Street, Wellesley www.smithandwollensky.com/ our-restaurants/wellesley 781.992.5150 n THE FARMHOUSE 970 Great Plain Avenue, Needham www.thefarmhouseneedham.com 781.449.6200 n BUTTERCUP 13 W. Central Street, Natick www.eatbuttercup.com 508.975.4157 184 W e l l e s l e y W e s t o n M a g a z i n e | f a l l 2 0 1 8 food & wine "full of flavors"